As her time permits, Ruth writes essays about life in and around her neighborhood. Topics vary, but something interesting is always going on in Ruth's Neighborhood! When Snowy has supper for the first time at Tom’s house, the New England boiled dinner that his mother serves is exactly what Don’s mother, Marion, served the first time I was invited to Don’s house. Marion was a very good cook. Her mother ran a boarding house in the Weirs, and that’s where Marion learned her repertoire, from meat loaf to liver and onions, from creamed cod to chicken pie. She was renowned for all her pies, apple, blueberry, custard, all of them. By the time I met Don, my mother had pretty much given up making pies from scratch and bought Table Talk, so I was very impressed, and in our early-married years I too made pies. Marion was the kind of cook who didn’t need recipes and just winged it from memory. When I wanted to make Don’s favorite rolls of hers, bran rolls, I had to beg her to write down the ingredients and measurements for me. She eventually scribbled them down, but it was Don’s methodical father, Jim, who typed them up for me on a file card. Her repertoire was, however, basic New England fare. So I was startled when, after Don and I were married and I became part of his family’s Christmas celebration, Marion didn’t serve a pie after the big turkey dinner; she served a glamorous dessert that she called a Snowball. She was never clear about where she got the recipe; probably she’d forgotten. Don remembers that his aunt was more experimental and wonders if Aunt Barbara might have seen it in a magazine and suggested it to Marion. In any case, the Snowball was in its way the best part of their family traditions, complicated as Christmases and families are. For Don the Snowball brings back the happiest memories. After Jim died, Marion continued making Christmas dinners complete with the Snowball, even though the Snowball was becoming too big a chore for her. Fifteen years later when she moved into a nursing home and everyone realized this could be the end of the Snowball, Don’s sister and nieces tried to carry on the tradition, but it’s a lengthy recipe to cope with in a busy season. I’ve always meant to give it a try too; year after year I’ve resolved to. Maybe this year? My own family’s traditions were more varied. Sometimes we went to Lexington to my grandparents’ and sometimes they came to our house, swapping back and forth with Thanksgiving. Sometimes just my parents and my sister, Penny, and I were at home for Christmas, and my mother would announce she’d had enough of cooking a damn turkey at Thanksgiving, so she served steak, and at one stage we even went out to a (very casual) restaurant, back in the days when you didn’t go to restaurants often. It was all quite lighthearted in comparison with Don’s family’s Christmases. The recipe I’ve saved from Doan Christmases is my father’s recipe for eggnog, which of course he served us kids without any booze in it. This also is a recipe I’ve never made, probably because I’ve grown up to be timid about eating raw eggs so I buy commercial eggnog in a carton at the supermarket—and that does bring back memories of my father with a mixing bowl and eggbeater. Don and I have never put much effort into Christmas, probably because we don’t have children. In the first years, at Keene Teachers’ College’s married students’ barracks, we did decorate a tree, but instead of tinsel and red-and-green bulbs we used soapsuds and blue bulbs. We saved our empty beer cans and heaped them underneath instead of presents. I searched for hot pink wrapping paper for our parents’ presents. Oh, weren’t we unconventional! And yet . . . I’ve kept the plastic angel that was always on top of my folks’ tree, and I get her out every year and prop her on a table. Don has had to repair her, re-glue her hair. 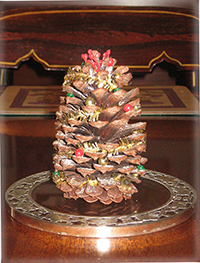 I also unpack and set on the dining table a little Christmas tree made years ago from a pinecone by my dear friend Sally when she learned we didn’t have Christmas trees. And on the ell door’s window I hang a red Christmas stocking with jingle-bells trim, one of the two our grandmother made Penny and me. When Penny and I reminisce about Christmases past, we remember how Penny would come jingling into my bedroom with her red stocking early on Christmas morning before our parents were awake, and in my bed we’d open them together. There was always a tangerine in the toe. Set in refrigerator until wiggly. Break cake into small pieces. and a layer of cake alternately until full. Beat the six egg yolks until light. Fold whites gently into yolks mixture. Serve with nutmeg sprinkled on top.